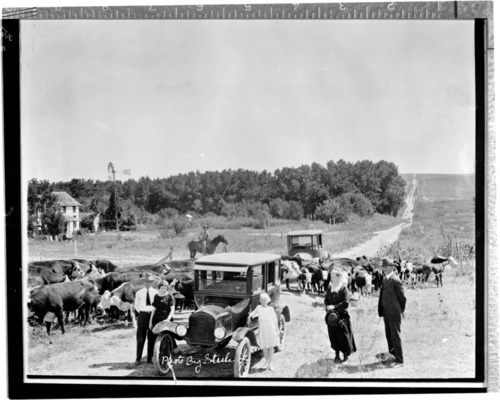 This black and white photograph shows a group of people standing beside an automobile as cattle roam nearby. In the background the homestead of Mr. and Mrs. David Paul is visible. The two-story structure was original a hotel for men in 1888. For a number of years Fourth of July celebrations were held in the grove of trees. There is a windmill by the house. The photo is near Weskan, Wallace County.